Damnation is looking nothing like the buggy, crash-prone demo I saw at the Penny Arcade Expo last summer – thank goodness, too; the release date is right around the corner. First impressions can be rather damning (lol, pun). When I first saw the game back in August, there was only one firefight that you could actually beat without crashing the demo. Based on that, I assumed the entire game was a third person shooter with a space western premise (only without the space). Turns out, Damnation is actually a different game altogether than what I first thought. Sure, the shooting is a part of gameplay – but there's much more to it that wasn't there seven months ago. 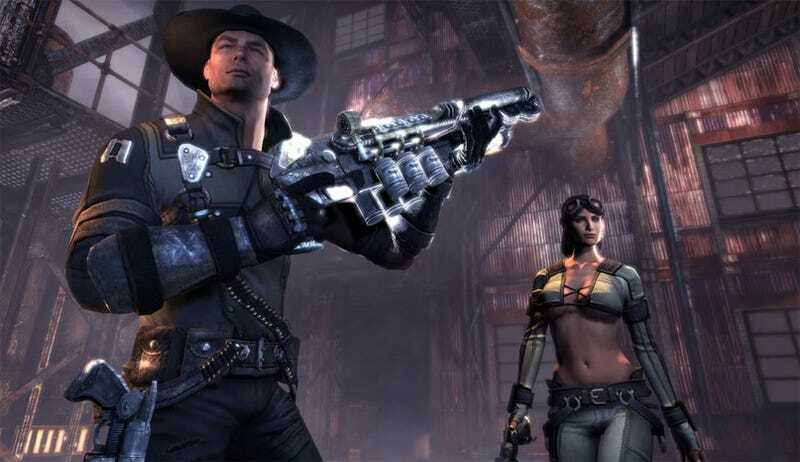 Damnation is a third person platformer/shooter, starring Captain Hamilton Rourke – a Roy Rogers for the 22nd Century. The game is technically set in an alternate reality future where the Civil War has dragged on indefinitely, the Industrial Revolution has come and gone, and for some reason women have given up bras (and not for the better). I watched someone play through the latter 2/3 of a level; then played through the first half of the level, when it was my turn. The entire level was about 25-30 minutes long (and only because I got lost). Damnation hits the Xbox 360, PS3 and PC March 3, 2009. This build had to be near-final. Can we get some color? : The first level takes place in an underground mining town, so the scenery was rather dull: tin houses, rocks, more rocks and guys with shotguns that dress in clothes that resemble rocks. The developer has made a fuss about presenting America in all her purple mountains majesty – but damned if I saw a single color besides gray. Get your genres straight: Technically, Damnation is supposed to be steampunk, but I think the developer is just labeling it that for lack of a better term. Steampunk means Victorian England era dress, gadgetry, zeppelins, and sometimes alchemy – none of which seem to be in this game. They'd have been better off calling "Space Western, but Without the Space." Jerky, and not the beef kind: The character models don't move with depth or fluidity. They jerk a little when they break into running or climbing animations, and their idle standing poses have more in common with store mannequins than they do with human beings. What do you mean there's no map?! : The levels in Damnation are actually quite huge. That first bit in the mining town was pretty simple to figure out because it was linear – but a glimpse at the second level (set in a mountain range) revealed that there could be many paths through certain levels. And they're telling me you don't get a map. The platforming: Rourke gets around the way that Lara Croft explores tombs – climb this, jump on that, wall-jump upwards to the next level, etc. The game is pretty forgiving when it comes to blind leaps – something called "ballistic prediction" will let you land a jump on the nearest ledge it looked like you were aiming for, rather than letting you fall and forcing you to go back through the puzzle again. Also, the game won't let you walk off cliffs – a major plus. Spirit Vision: I'm a little uncomfortable with Damnation relying on Native American mythos to explain its magic; but the Spirit Vision mechanic is definitely handy. By toggling this mode with I think the left bumper, you see glowing outlines of enemies and allies in a given area. It's not so precise as to tell you exactly where everyone is (they might be behind a wall, or one floor up, etc. ), but when your allies are down and need you to revive them, it's so much easier to locate them without getting your head blown off by that sniper you didn't see up in the hayloft. Shotguns: You can't have the Wild West without them. Damnation has come a long way from PAX and an even longer way from its Unreal Tournament 2004 mod origins. Even if parts of the gameplay are twitchy and it's not the prettiest game we ever see – it's still the American Dream in action; a video game reincarnation of the Lewis and Clark Expedition. I have no idea if that means "fun," "worth your money," or "game of the year," but come March, I'll be happy to find out. When was the last time we had a cowboy game, anyway?